Meet Holly Keenan, our second artist of the month! Chosen Medium and Why: It is a small acrylic painting, just 25 cm square. Acrylics are useful because you can keep going back to the piece and add more paint. Painting Experience: I enjoyed doing this painting- but was surprised at how long it took to complete- I kept going back and changing the colours in the sky and sea until I was happy with the balance of colours. I have since painted two other versions of this view – but this one is my favourite. My Inspiration: This is one of a series of portraits done of family members in 2016. I took a photo of my granddaughter Holly on her birthday- wearing her party dress. I liked the way the light was coming in strongly from behind her on the left, and the sense of movement in the informal pose. Painting Experience: I really enjoyed painting Holly and kept in mind that I didn’t want a tight, formal painting – so kept brushstrokes free and loose, avoiding any attempt to do any more than evoke an impression of flowers on her dress. My Achievement: I have managed to capture a good likeness of her, and was particularly pleased with how the yellow satin sash looked in the final painting as well as the highlights in her hair. One of my students brought in a photo of these four puffins on Arran. She wanted to paint it but didn’t know where to start. We were both inspired because this was a local scene. This painting came about by demonstrating techniques to a student and developed into a project for myself as well. I decided to demonstrate how I would begin. I started with practise sketches of the birds until I could feel the shape of the birds. The birds were painted with watercolours and then I used white gouache so that the puffins’ feathers look thick and fluffy. Painting the birds was so enjoyable. I was more interested in the birds themselves rather than background, therefore when it came to painting the background I did simple washes of watercolour. I wanted to get a fair amount of detail in the birds without overdoing it too much, as that would put it out of kilter with the backdrop. Each puffin felt like it had its own personality, and as each individual bird came to life it motivated me to continue painting. Try using a small amount of gouache paint to make parts of your painting bold and stand out. My Inspiration: My inspiration was my favourite artist Martina Shapiro – I love her bright bold paintings. Plan: I planned this painting by studying Martina Shapiro’s work very closely. Chosen Medium and Why: I decided on using mixed media for this painting. I used plaster of Paris to get a bumpy texture on the paper then used a pallet knife and brush with acrylic paint. Painting Experience: This piece went very well, I didn’t really encounter any problems. My Achievement: I am especially happy with this painting because I did a few before which were not as strong. 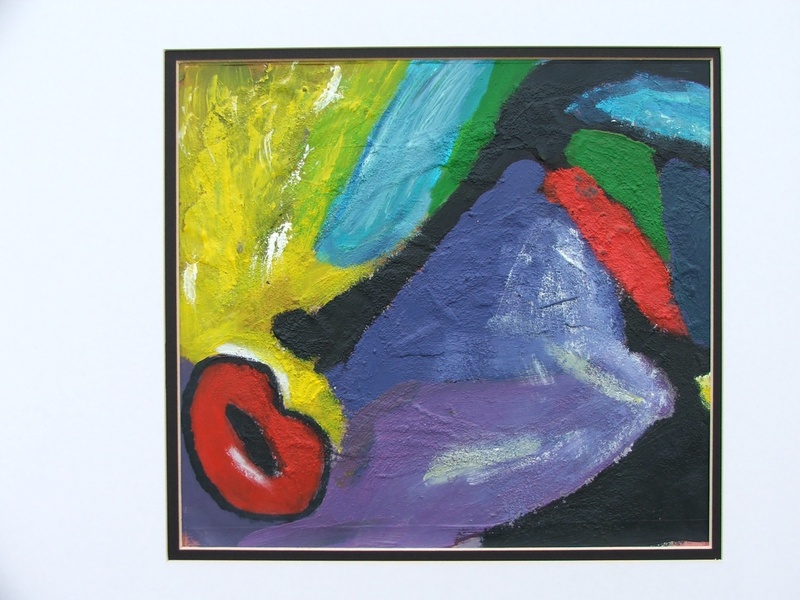 I also love the boldness of colour I achieved – it’s very eye catching. Little Artist’s Tip: Check out Martina Shapiro’s work to see how she inspired Lindsey! My Inspiration: I am a lover of tea and I enjoy a cuppa with my friends and this idea was the foundation for this project. I began studying people (mostly my friends and family) and their facial expressions whilst drinking tea. The deeper I got into the project, the more I realised that I enjoyed the social aspect of tea drinking. I began to design images which could be exposed onto screens which could be printed onto fabrics for an interior setting. Plan: Screen printing is a very long process to carry out, and it does require a lot of planning. I had to come up with designs to be exposed onto screens, coating and prepping the screens, mixing up dye colours / pastes to print with and experiment with these first to make sure they were the correct colour etc. Once I had planned everything my final product was made very easily and quickly. Chosen Medium and Why: As I was printing on 100% linen, I needed to use a reactive based dye so that when the fabric was washed and steamed, the dye would stick to the orange fabric. 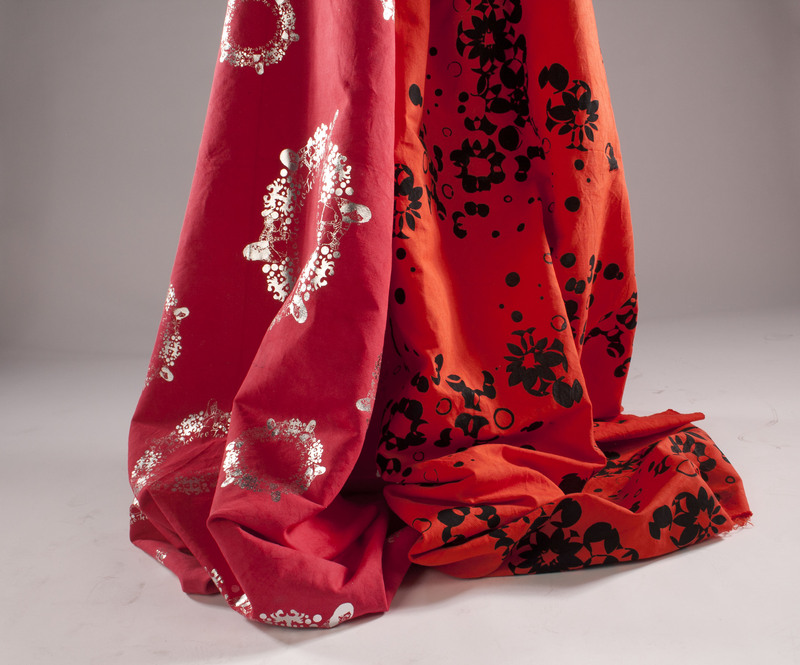 For the red fabric, I decided to print with a special heat resistant foil which would make these curtains unique and different! Painting Experience: Many things went wrong with my first attempts at screen printing these shapes and patterns. I would always do a test run on a similar fabric first before starting on the final piece! I was always encouraged at university to make mistakes and most of the time these mistakes ended up in my designs! My Achievement: I love how effective the silver foil doilies, show up against the gorgeous red fabric. I feel that from a distance, they look like ordinary lace doilies but on closer inspection they tell a story, and almost resemble a group of people sitting around a table, pouring tea and enjoying each other’s company. I love how different and bold they are and I would definitely have these drapes hanging up in my house… though perhaps not together! Little Artist’s Tip: When screen printing, you should always test the shapes out first on a piece of fabric before printing on your final piece. 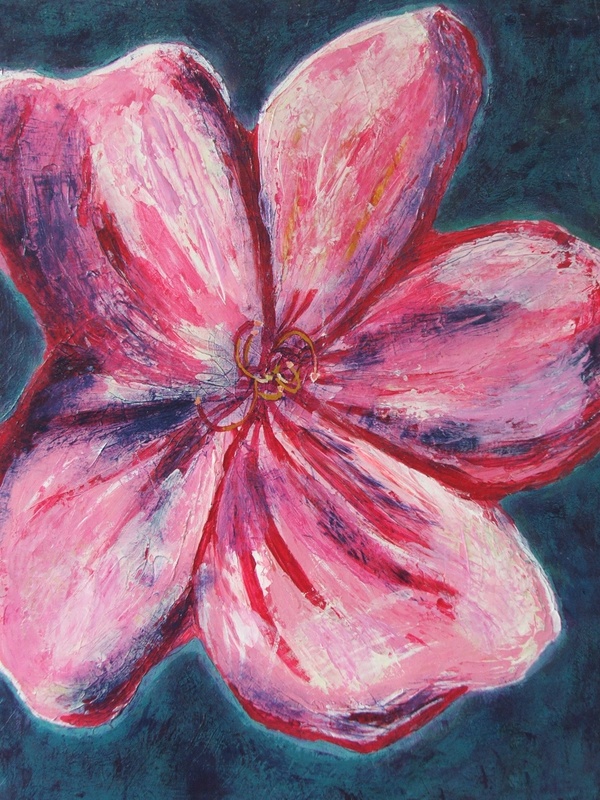 My Inspiration: I was inspired to paint this piece when I began looking at lots of beautiful flowers. I found Georgia O’Keeffes work particularly inspiring. Plan: I planned this painting by trying it in chalk pastels and water colour first but I felt afterwards that acrylic worked better. Chosen Medium and Why: I used acrylic on canvas with a pallet knife and a dry brush technique round the outside of the flower. Painting Experience: It took a while to do as I kept painting over and over it to get different light and dark tones. My Achievement: I absolutely love the colours and texture I achieved in this painting.